Category leader will introduce apparel, training tools and gear to cyclists and fitness aficionados at the Interbike show in Las Vegas. Mad Dogg Athletics, creator of the Spinning® program, will now offer its complete line of branded apparel, bikes and products to the IBD network. The world leader in indoor cycling education and products will introduce its Spinner® bikes and 2008 apparel collection at the Interbike show in Las Vegas at the Sands Expo Convention Center on September 26-28 at booth number 6582. Until now, the products have been available exclusively at spinning.com and select Official Spinning Facilities. Collectively, the products offer IBD outlets the opportunity to expand their range of offerings to fitness-minded riders and performance-oriented cyclists alike. 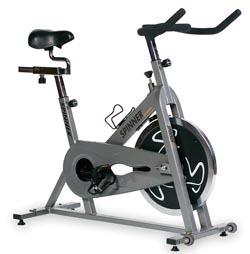 Designed to offer a real bike feel, Spinner® bikes by Star Trac are an ideal training partner for cyclists. Free from distractions, inclement weather and safety concerns, training rides on a Spinner bike lets cyclists focus on their goals and offers an alternative to riding on a trainer. For the more casual rider, a series of ten DVDs provides structure, motivation and variety. "The Spinning program was originally developed by athletes, for athletes, when ultra-endurance athlete Johnny G created the program in 1987 as a way to train for the Race Across America," states professional cyclist and Spinning Master Instructor Joshua Taylor. "By embracing a 'go at your own pace' philosophy, it has since endeared itself to a much broader audience. But the program's fundamental values of heart rate training and periodization have made the Spinning program a fad free modality that is as applicable to professional cyclists as it is to fitness buffs." "Our roots are in cycling, and we've never forgotten that," states John Baudhuin, president of Mad Dogg Athletics. "The program's core movements are designed to simulate responses to flats and hills and a balance of strength, endurance, intervals and recovery are encouraged. By expanding distribution through the IBD network, we're hopeful that these businesses can capitalize off a program that has enhanced the fitness level of millions worldwide." Branded apparel including shorts, jerseys and casual wear render riders equipped for the road ahead while accessories like gel cushioned seat covers make rides more comfortable and enjoyable. To request a catalog and pricing, please contact Michele McDonnell at 310-823-7008 or michele@spinning.com. For more information on Mad Dogg Athletics' product line and the Spinning program, please visit spinning.com. Venice California-based Mad Dogg Athletics, Inc., steward of the Spinning brand of indoor cycling, is the worldwide leader in indoor group cycling bikes, education and products. The company works closely with Star Trac on its patented line of Spinner bikes and develops and markets Spinning instructor orientations, continuing education programs and offers a complete line of Spinning-branded apparel and accessories. With its team of over 150 Master Instructors, MDA has trained over 165,000 Spinning instructors in 80 countries worldwide. For more information about Mad Dogg Athletics, Inc. visit www.spinning.com. SPIN®, Spinning®, Spinner® and the Spinning logo are registered trademarks of Mad Dogg Athletics, Inc.